girl.meets.farm: Baby blues or just recovering? Remember to sleep when the baby sleeps. Apparently the folks who provide advice to mothers post C-section don't have a toddler to deal with at home. Hubby is beyond fantastic. I mean, seriously beyond. I think I am suffering from mild post partum, and I have to push myself to shower and join in the comings and goings of the day. Fortunately, it's very mild, and I completely adore this new little red headed girl. 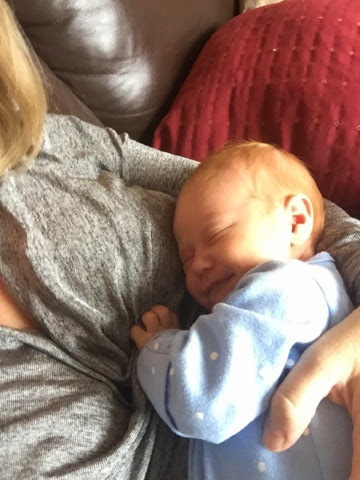 (They say that post partum depression can lead to feelings of dislike for the baby - so I am not sure if it's post partum or if I am simply recovering from the surgery and supposed to feel this way.) I simply feel... blah. I can't be motivated to do much. I have absolutely no get up and go which isn't like me. Everything just seems so overwhelming. Hubby has been taking on the lion's share of household activities. Making breakfast, taking care of the wee farmboy, tidying up. You name it. He's on it. Add to that he has been bringing me tea and ensuring that I am comfortable. I am almost at the 4 week mark - and I know if I can make it to 6 weeks I will begin to feel like myself again. Right now having a shower seems like such a monumental task. I keep seeing these new mom's on Facebook, all put together with their lipstick on and their hair in place. I am lucky if I manage to get all of the shampoo out of my hair and find a pair of track pants that fit over the incision site. "Off to my first post baby work out! So excited" - I don't know whether to be jealous or relieved that this isn't in the cards for me. Given how I feel these days I would opt for the latter. Now excuse me as I curl up on the couch with my tea and my wee girl...and do absolutely nothing.